Belgium has long struggled to deal with its colonial past. The small European country controlled large parts of Central Africa from the early 1900s to the 1960s. During colonial rule, millions of Africans died from disease, starvation and violence. 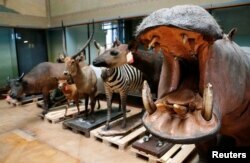 Recently, Belgium’s Royal Museum for Central Africa reopened after five years of building repairs and improvements. The $73-million effort aims to show visitors the reality of colonial rule and modern Africa. The Royal Museum for Central Africa first opened in 1910 during the rule of King Leopold II. The museum was set up to to show the power of his empire and the colonial riches it provided. Just more than 100 years later, museum workers have tried to completely change that. Guido Gryseels is the current director. "Our aim was to make a museum of contemporary Africa, the Africa of today. But at the same time to also bring a very critical look on the colonial past of Belgium. We recognize now the many victims of colonization, the African victims of colonization. We recognize too that a lot of the racist attitudes that were developed at that time have their consequences today." Those ideas are personified by a group of statues showing Africans as simple and animal-like. The statues formerly were placed all around the building. They are now kept in an underground room. The museum also had a collection of living things from the colonies. This zoo served as home to more than 250 Congolese people. They were forced to wear traditional clothing. Seven died from being out in cold weather. Museum workers have been doing research on other collections. This new information has been added to some objects. It tells where they came from and explains their importance. Videos provide an African understanding of issues such as culture, colonialism and the environment. King Leopold II built the museum to raise money for mining and rubber production in what is now the Democratic Republic of Congo and Rwanda. It is estimated that up to 15 million Congolese died from disease, starvation and mass killings under colonial rule. Mireille-Tsheusi Robert is Bamko-Cran, a Brussels-based anti-racism group. She says the museum has not gone far enough to show the horrible nature of colonialism. Robert says that when the museum is presented as a museum of Africa and not one of colonization, it creates misunderstandings. She added, "We need to make a real museum of colonization, we need to deal with our colonial history. It is really something that is missing in Belgium." Director Gryseels says he is open to returning stolen goods to Africa. "Well, certainly it's not normal that 80 percent of African art is in European museums or in European private collections. So we have to make sure that they can get much greater access to our collections..."
Henry Ridgwell reported this story for VOANews.com. Jonathan Evans adapted the report for Learning English. George Grow was the editor.